Shivmoga,Aug 15: Jog Falls or Joga Falls in Karnataka holds a record for being the second tallest one in the country. With a huge amount of rainfall in the catchment areas, the waterfalls are flowing in full glory after nearly four years. The picturesque beauty has attracted over a lakh of tourists in just two months. The waterfall is created by the Sharavathi River plunging down to 830 feet. The authorities opened 9 of the 11 gates of the Linganamakki reservoir as the water levels neared the full limit of 1819 feet. The water levels recorded were 1815 feet and the last time the dam water reached such high levels was four years ago. The dam was constructed in the year 1964 and since then it has been only 13 times, the water levels have risen to the limit. To witness such a spectacular view of the roaring falls, tourists are thronging in great numbers. According to sources in the Jog Management Authority, a total of 1,63,855 tourists visited the waterfalls during the months of June and July and it included 70 foreigners. According to a report in Deccan Herald, "June recorded a tourist footfall of 70,401 while it rose to 93,454 in July." Pictures and videos from the spot were also shared widely on social media. 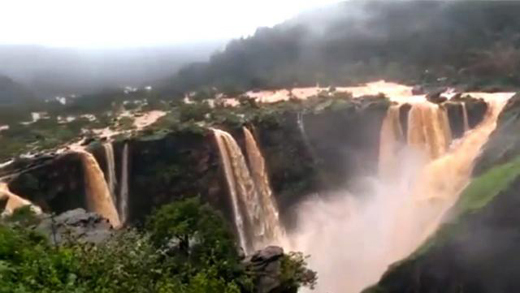 The area of Shivamoga district where the Jog Falls are located saw a heavy rainfall of 104.2mm in about two days in the week. So thanks to the heavy rainfall the waterfalls are only roaring, making for a breathtaking sight.